Underlining slow progress in the indigenous project to design and build six nuclear-powered attack submarines (SSNs), India and Russia have signed a 10-year lease for a new Russian SSN, which will join the Indian fleet around 2025. The navy already operates a Russian SSN, called INS Chakra, which was taken on a 10-year lease in April 2012 for almost a billion dollars. This was to return to Russia in 2022, but defence ministry sources say its lease could be extended by three years, while the next INS Chakra is built. India leased its first nuclear submarine, the Charlie-class INS Chakra, in 1988. That went back to Russia in 1991 and the navy did without an SSN for 21 years until it leased an Akula-class SSN, the second INS Chakra, in 2012. India has indigenously designed and built a nuclear-propelled, nuclear ballistic missile submarine (SSBN), called INS Arihant. 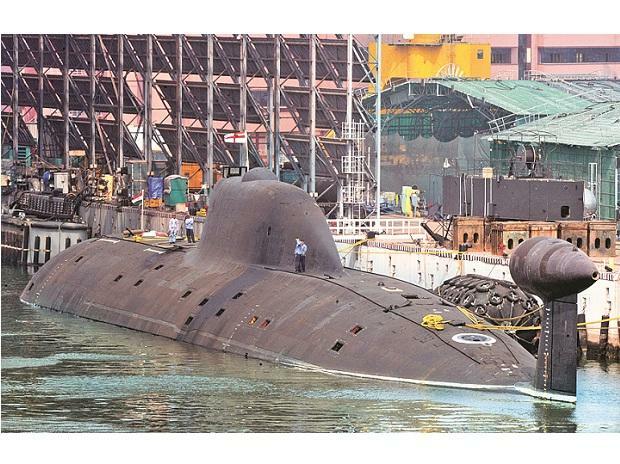 A second SSBN, called INS Arighat, is to follow shortly, with two more in the pipeline. SSBNs are not a part of the navy’s combat fleet. They are armed with nuclear-tipped ballistic missiles that are the underwater leg of India’s nuclear delivery triad — i.e. nuclear weapons delivered by land-based missiles, aircraft-dropped weapons and those fired from under water. SSNs, in contrast, are a part of the navy’s combat fleet. They are propelled by a nuclear reactor, but do not carry nuclear weapons. Their weapons load consists of land attack and anti-ship missiles, and torpedoes to sink enemy shipping. While the current INS Chakra operates Russian weaponry and command systems, the next model will be fitted with Indian systems to validate them for the indigenous submarines. However, a key system that remains to be developed is a nuclear reactor for the SSN. Besides INS Chakra, the navy operates 14 conventional submarines and is to receive five more Scorpene submarines, which are under construction in Mazagon Dock, Mumbai. These also fire missiles and torpedoes but, since their diesel engines cannot run underwater for lack of air, a conventional submarine can remain submerged for only as long as its on-board electric batteries provide power. When the batteries are drained, typically in 8-48 hours, the submarine must surface to run its generators and recharge batteries. A surfaced submarine is vulnerable to detection and attack. In contrast, an SSN’s nuclear reactor can run underwater, allowing it to remain submerged indefinitely, when it is extremely hard to detect. This allows SSNs to slip underwater into its patrol area — say, the Gulf of Malacca — and lurk in ambush for days on end, listening through its sonar for enemy ships. Then it can torpedo them and escape at high speed underwater. SSNs are ideal for these so-called “sea denial” missions, in which one denies the enemy the use of the sea. Meanwhile, the navy uses aircraft carrier battle groups for “sea control” missions, where carrier-borne air power dominates an expanse of ocean. The cost of the 10-year lease signed on Thursday is being reported as $3 billion. That would be over thrice the cost of the lease of the current INS Chakra.